After some damn hot days 3-4 weeks back I wanted to know exactly how hot it was both inside our house and in the Mancave/shed. I found this webpage and bought way more 1-Wire sensors than needed. All up I bought 10 DS18S20’s, 9 ttl to USB convertors, 5 water proof probes (DS18S20’s included) and 2 RS-323 serial probes (DS18S20’s included). I have 2 low powered Open-WRT devices that now have sensors connected to them via USB to TTL convertors – a wireless router and a HP T5510, both have a squeezeslave client and a security webcam. The program used to retrieve the temperatures from the sensors is Digitemp, the output is then piped to a file on the server via NFS share. From there it gets picked up by Collectd and graphed. Another cron job sends the temperatures to Motion. Solder a chip to the TTL convertor (described here) and plug it into the PC/router – you may also have to download the driver for the USB convertor like I did. Type lsusb (lsbutils or similar is required) or dmesg, look for the convertor chipset name, then check available packages to see if you can download it easily. Example; opkg list|grep <chipset>, or maybe “aptitude search <chipset>” – depending on your OS of choice. Setup a share between the device and server if it’s not being saved to the same device. I used NFS, because it was already setup. Install and configure digitemp – available through most package managers. Followed most of this guide to setup the conf and cron job. Not all of it is required to output to a simple text file. 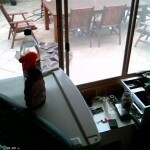 The webcam images below are from the kitchen and mancave, you can see the current temp (sampled in 5 minute increments) at the bottom left of each. 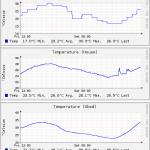 The graph shows a history of the temperatures. This setup would be great for cool rooms, server rooms, and any other environment controlled room or container. 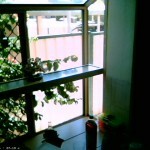 This entry was posted in Hardware, Software, Tech and tagged DS18S20, Motion, Probe, Temperature, Weather, Webcam by Kristian. Bookmark the permalink. Very nice article.I have installed digitemp and one DS18s20 via USB to serial. But I would like to help me with installing collectd on WR703N and saving data on the temp folder on the same device + collectd temps to be accessible via simple web page..
Is it possible to move the data to a different device? Collectd can use a fair chunk of processing for rendering the graphs. Maybe keep the data on the wr703n but run collectd on a different PC?